On Friday, October 5, ArchimandriteTikhon presented the English version of his book, Everyday Saints and Other Stories, the number one bestseller in Russia, at the Library of Congressin Washington. Father Tikhon, who is also the Abbot of the Moscow Sretensky Monastery, hopes that the experience of Russian Orthodox Christians of the 20th century, as reflected in his book, will be interesting to Americans and that they would be able to relate to it. "First and foremost, this is a book about the life of Christians in Russia, about the way people live with God in a real and pressing reality. Of course, the experiences of Christians in Russia in the 20th century are immense and unique, despite the fact that these events are comparable to the persecution of Christians in the early Christian era. Orthodox Christians in my country do not feel like heroes. Many were thankful for the hardships that have been sent to them, because this experience helped them to gain God. 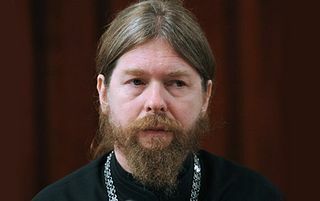 It was a unique opportunity to fulfill God’s commandments in those difficult circumstances," said Archimandrite Tikhon at a press conference. He noted that the uniqueness of the situation in the Soviet era lies in the fact that Christians were the subjected to harassment. Nevertheless, they did not perceive the events as a hopeless and terrible tragedy. "They understood that the country is ill, that a lot should be changed, but they never felt detached from the people who have turned away from God. I see this as the difference between them and the secular dissidents as many of the latter were stuck in gloomy pessimism and heavy feelings. Real Christians endured the suffering and remained full of faith, hope and love", said the priest. However, he stressed that the book does not only contain stories of the tragic events. "The Christian life is versatile and amazingly interesting", said Archimandrite Tikhon. Responding to a RIANovosti question on whether or not he hopes that the English translation of the book is going to serve for the convergence of different Christian denominations, Archimandrite Tikhon said: "In terms of discovering the world and God, every person, regardless of his or her religious affiliation, has something special to say to everyone ". "Once when I was in the United States I met with a Texan that truly impressed me. He is a man that has lived a long life; he was almost 70 years old at that time. And he somehow quite simply, without showing off, said that he had never missed a Sunday service in the Protestant church that he attended. He certainly was not a theologian, he was a simple man, but he revealed himself as a true Christian", said the author of Everyday Saints. "In this respect, if Americans find the experience of the Russian Orthodox people’s faithfulness as Christians in both good times and bad times to be worthy of note and motivating, it will be a great reward for all those who contributed to this book. But at the same time it is naive to think that all churches will unite over time and become one. Although the idea is moving," he said. Answering journalists' questionson howhis bookhas become so popularin Russia (the total number of copies sold has reached 1.1million) he noted there was no special marketing effort made. "Peoplebegan to discussthe bookin social networks, so that did the trick", he said. All profits frombook sales in the United Statesand elsewhere will goto the building of the memorial Cathedral Church of the New Martyrs and Confessorson Lubyanka Street. (Lubyanka Street is the location of the infamous Communist area Lybyanka prison, where many people including Christians were imprisoned and tortured) Churchconstructionisplannedtobecompletedby 2017. "We want tobuild a beautiful and bright church, marking the triumph of good over evil and cruelty. We want to complete this temple by the February of 2017—the one hundred year anniversary of those well-known events of the past. There are many memorials dedicated to these events that are now being designed and considered, and many of them are rather dark and depressing. But that is not the point of all that history, not a good interpretation," said Archimandrite Tikhon.